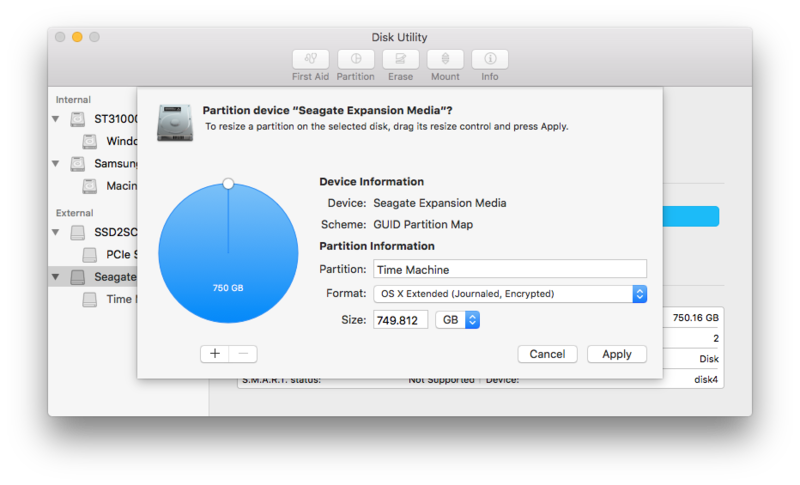 Contrary to the belief of some, you can still format a drive inside the somewhat-crippled Disk Utility application. Many have claimed online, that the only way to enable encryption on a disk today, is to do so with the Finder, by choosing the Encrypt option in Finder – after formatting. This then takes a painful amount of time, as the entire drive has to undergo sector-by-sector conversion. You don’t need to do this! The option to format-and-encrypt has simply moved. The upcoming APFS file system has been in the brewery for awhile, and elements of it track back to FileVault 2 and HFS+ Encrypted volumes. It centers around the notion that a drive is partitioned – and that even if a drive has just one partition, there should be an overhead wrapper. This is why to turn off encryption on a drive pre-El Capitan, you had to jump through the elaborate process of repartitioning the drive, removing encrypted partitions (even if there was only one), and then formatting the drive fully. This one tripped me up, as I’m one of those bitter-clingers that still wants a GUI for RAID and other functions. Yeah, APFS is supposed to end the need for stuff like that – but I still think OS X (or macOS, or Mac OS, or System 7 – damn it!) should have a robust Disk Utility that caters to the most advanced users… and still offer a simple mode for beginner and intermediate users. I really think El Capitan didn’t strike the right balance there. RAID returns to Disk Utility in Sierra.